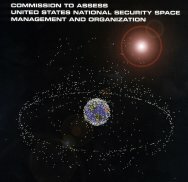 The Commission to Assess United States National Security Space Management and Organization was established pursuant to Public Law 106-65, the National Defense Authorization Act for Fiscal Year 2000, Section 1622. The security and economic well being of the United States and its allies and friends depend on the nation's ability to operate successfully in space. To be able to contribute to peace and stability in a distinctly different but still dangerous and complex global environment, the U.S. needs to remain at the forefront in space, technologically and operationally, as we have in the air, on land and at sea. Specifically, the U.S. must have the capability to use space as an integral part of its ability to manage crises, deter conflicts and, if deterrence fails, to prevail in conflict. How the U.S. develops the potential of space for civil, commercial, defense and intelligence purposes will affect the nation's security for decades to come. This chapter describes the principal organizations involved in national security space activities, concentrating on the Executive Office of the President, the Department of Defense, the Intelligence Community and the Congress. A number of issues transcend organizational approaches and are important to the ability of the U.S. to achieve its objectives in space. These are issues that the national leadership, the Department of Defense and the Intelligence Community should address in the near term, irrespective of particular organizational arrangements that may be pursued. Resolution of them would both benefit and support organizational changes. National security space organization and management today fail to reflect the growing importance of space to U.S. interests. The members of this Commission have, together, identified five matters of key importance that we believe need attention quickly from the top levels of the U.S. Government. We have drawn these conclusions from six months of assessing U.S. national security space activities, including 32 days of meetings with 77 present and former senior officials and knowledgeable private sector representatives. This chapter contains resumes, meetings, acknowledgements, and a glossary for organization charts. Additional documents used by the Commission will be made available by 9 February, 2001.